The list of headwinds facing the equity market seems to be growing longer every day. However, the top concern is the question of whether the economy is headed for a recession or not. In several prior posts, we have noted our view is a recession is not imminent. Certainly slow GDP growth continues to be the constant in this long recovery. Much of the market volatility though seems centered around the energy and material sectors. At the end of 2014 a barrel of oil was trading for $53.27 and closed today at $27.64. Demand for oil has not been the issue, it has been the continued growth in supply. The low energy prices have resulted in large capital expenditure cuts in the sector and this has spilled over into the industrial sector, especially those firms selling into the energy space either directly or indirectly. The earnings results for energy firms and those firms impacted by the energy contraction have dominated the headlines. In evaluating the fundamental health of companies outside of energy, we believe it is worthwhile noting expected 12-month forward earnings growth, ex energy, is anticipated to be just over 13%. We do believe this is a little optimistic; however, high single digit EPS growth is achievable looking out 12-months. 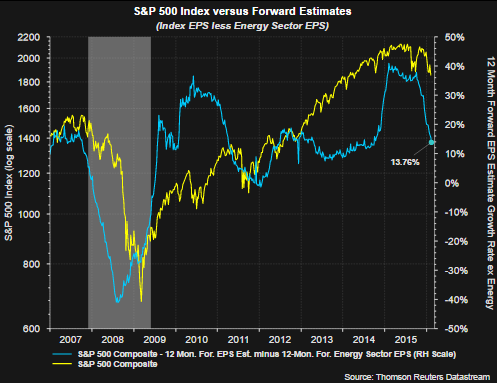 On an operating earnings basis the energy sector is expected to contribute a negative $7.71 to overall S&P 500 Index reported operating earnings in 2015. In 2016, the energy sector is expected to contribute a positive $7.45 to overall S&P operating earnings. Again, we think the energy earnings contribution is on the high side and is one reason we expect 2016 S&P 500 earnings growth around the high signal digits. Thomson Reuters excellent weekly earnings report from the end of last week included earnings growth expectations for 2016 broken down by quarter. 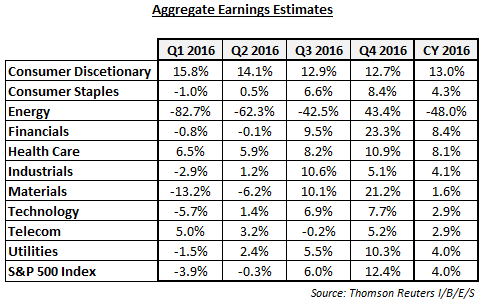 Evident in the below table is the weakness expected for earnings through Q1 2016. For the last three quarters of 2016, earnings growth improves in each quarter. Some of this improvement will be the result of lessening currency headwinds for multinational firms due to the strong US Dollar. At the end of 2014 the US Dollar/Euro exchange rate was $1.20. Through the end of November of 2015, the Dollar strengthened to $1.05 to the Euro. Subsequent to the end of November, the Dollar has been weakening and traded near $1.13 today. This weaker Dollar will lessen the currency impact for many multinational companies. Much of the bombardment of negative headlines has weighed on investor sentiment. Today the American Association of Individual Investors reported an 8.31 percentage point drop to 19.2% for the bullish sentiment survey reading. 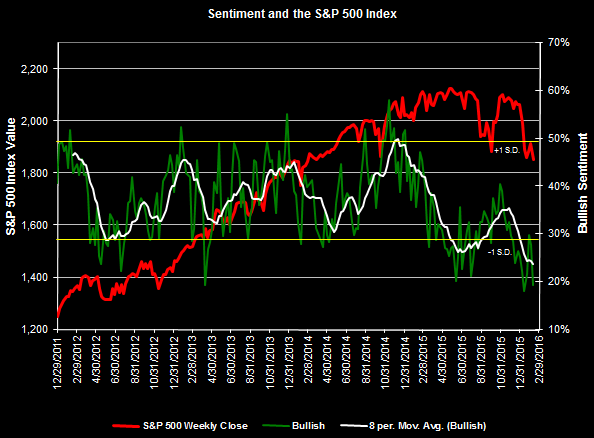 These bullish investors flipped to the bearish side with bearish sentiment increasing 14 percentage points to 48.7%. 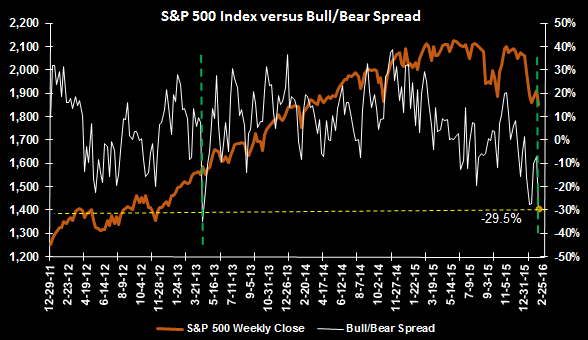 The net impact is the bull/bear spread is a wide -29.5%, the widest level since October 2008. These sentiment readings are most predictive at their extremes and the AAII Sentiment Survey is a contrarian indicator. Of course there are other issues impacting the market outside of energy and exchange rates, like always seems to be the case. However, we believe the energy headwinds, and the consequent impact on high yield credit and on bank loans, will have a much smaller impact as compared to the real estate issues in 2008/2009.